In September 2017 I took part in my 3rd Nunhead Art Trail, exhibiting with 3 other of my artist friends, whom I also share at Studio with at Bainbridge Studios, West Norwood. Emma Jayne Emmott Fine, Michelle Derrick of GingerLine Designs and Ceramicist, Billie Buck. On the first day, I was approached by a visitor Lindsey Praechter, who had come especially to our venue to view my work, having seen it in the catalogue. We had a brief discussion about my Laser cut Architectural panels, featuring different abstracted views of London and the London Skyline and she inquired as to whether I could make the piece any bigger than the A3 pieces I was exhibiting. Over the next few months, I was invited to Lindsey’s work place in Monument, London to view her offices and show some of my artwork to the managing director of the company, CBOE. I was invited to undertake a commission where I agreed to create each of my pieces 4 x larger than my original size and to create another 3 new framed designs to add to the collection. At the original meeting I showed them a piece of laser cut work that I produced of the London Skyline that has laser cut layers of coloured card arranged to create a 3d view of the cityscape. The original piece measures about 150mm in length and I was asked to create a new version of this measuring over 2.1m in wood!! Having a background in Set Design for Film, meant that I had lots of experience surveying spaces, so was able to collect some measurements of the offices for Lindsey, to ensure that the pieces fit in and could be supported by the existing walls. This was the biggest worry throughout the commission, was making the piece measuring 2.1m in length and weighing 60KG! We had to consult a structural engineer in order to ensure that the walls would take the piece and I had to incorporate a hidden hanging mechanism so that the piece could be safely wall mounted without compromising the design. Me with the Laser Cut London Skyline piece! I start my design process by photographing various views and landmarks of London and while photographing, I try to orientate the camera to capture interesting and different perspectives, focusing on the shapes of the structure and detail rather that the overall building. I then take the photographs and draw from them, creating simple, bold and v abstract shapes and patterns. Influenced by Artists such as Malevich, Kandinsky, Mondrian, Newman, Rothko, and The Bauhaus & Abstract Expressionist movements, I like to focus on block colour and abstraction to sit against the structural patterns of the laser cut wood. I use wood as it is such a warm material, and changes with each batch, making each piece rather individual. A new design featuring a laser cut Tower Bridge. Photo by Roger Cannon. Laser cut London Eye Panel. Photo by Roger Cannon. With lots of help from my wonderful husband and family, I created and installed 10 x framed pieces in total and one large free hanging skyline piece for the CBOE Boardroom. See photos, By Roger Cannon. The London Tube panel. Photo by Roger Cannon. Creating this body of work for Lindsey was very challenging, scary at times but incredibly rewarding. To see all the artwork in its new home, made me very proud and made me push the limits of what I thought i could achieve as an artist. I would never had had this opportunity without exhibiting at Nunhead Art Trail. A small community organising this every year is a superb opportunity for local artists to get their work out there, without having to pay a high price in exhibition fees. Its a great way to meet other artists in the neighbourhood and network with like minded people, and you never know who will walk through the door! Sadly I can’t take part this year as I will have a new born baby, but I hope to return in 2019. I am exhibiting at Bainbridge Studios, West Norwood as part of the Dulwich Artists Open House festival 12/13 & 19/20 May 2018. "We are a City-based financial services company that moved into a new office in 2017. We were looking for eye-catching artwork with a mix of natural elements, depth and bold colours to finish off the space and design. We could not have asked for a better end-to-end experience. We needed a few new pieces created, so we didn’t duplicate in our space, including a large installation for our boardroom. The design process was collaborative and produced a new favourite piece for me. New pieces were developed to fit the space with expediency and without sacrificing creativity and quality. The installation process was thorough and well-organised. It began long before the actual installation date with measurements and drawings to make sure all went smoothly on the day. Having the team install instead of hiring outside contractors made it seamless and cost-efficient. Having that level of structural expertise along with artistry is extremely rare. It also speaks to the high level professionalism and communication that Emma provides. We are proud to exhibit and very much enjoy Emma’s artwork in our office." All the art work is available for purchase, on a made to order basis. Please contact me on Hello@studio-m-Design.co.uk for more information. Smaller pieces of the London collection can be found in the Shop. Thank you! The top table centre-piece. Photo by Emma-Jayne Emmott. When it came to our wedding table decorations, Tom & I wanted to try and base them somehow on our love of film, so we decided we wanted to create something using Lego type film characters, like Batman, Harry Potter & Jurassic park..
Again trying to save money and do this ourselves, we decided to make little Dioramas/centre pieces using our skills as model makers again. I knew of some good places to source some model trees and foliage (try eBay or model making shop EMA in West Norwood) and decided make some little island type landscapes to sit our characters & table numbers into. Having used expanding foam for many prop makes before, I knew it was cheap and can easily create lots of volume, although sometimes its does go a little mad..! I sprayed the expanding foam (bought from a local B&Q or hardware shop) onto some plastic sheeting, to protect the floor and allow it to easily peel off. Leave it for an hour and its all set and ready to add fairy lights and paint. Firstly I cut out a hole underneath to house the battery pack of the fairy lights. The foam is really easy to carve into using a scalpel or craft knife, be careful though! This meant that when the islands were in place the battery pack would be hidden away, and the lights on. I bought a variety of green spray paints from a Art suppliers shop (try Cowling & Wilcox or similar) and sprayed the islands with different shades if paint. While they were wet, we added the fake foliage/ moss and left it all to dry. This is pretty much it! Once we got into the marquee, I had lots of helpers adding the lego/ toys and assembling the decorations. I laser cut the table numbers out of plywood, with a font matching that on our wedding invites. The table numbers could easily be sunk into the foam, as it almost acts like floristry oasis. If you like the table numbers, you can buy them here. I'm sure flowers would sit into too, as it is firm but easily pierced with a stem or skewer. The dressed little islands were then placed on some log rings that we had had cut by the local timber yard, and beautiful glass bell jars sat over the top to finish them off. We only had six tables but I decided to do two decorations per table as the tables were so long. I think they turned out really well…!! If you would like Emma to make you some wedding table decorations or would like to get in touch about an idea, please contact us here. Making our wooden wedding Chandeliers! Tom & I had seen some wooden wedding chandelier decorations on Pinterest and felt that they would fit our woodland wedding theme really well. Having had a scout online, I couldn’t find anything suitable so decided to make my own! I used to make props for Nickelodeon TV, so thought some of my resourcefulness might come into play here..and roping in my art teacher friend Emma-Jayne (http://www.emjayartworks.co.uk) whom I paid in Gin to help!! I thought between us we should be able to fashion something half decent!! I wanted the diameter of the wedding chandeliers to be at least half a metre as our marquee was massive, I knew they would have to be big enough so that they didn’t get lost in the space. I decided to buy some plastic hula hoops from eBay, as these would give me a good size and structure to work from. The hoops needed hanging so that we could work all the way around them and so we hung them off ladders that we had in the garden. Anything would do for this, so long as you can get underneath the hoop later. I was thinking that the hoops needed padding out so popped to my local B&Q in West Norwood and bought some of the pipe insulation, that already has a slit down one side ready to thread onto your house pipes! It was a little small for the hula hoops but once in place, I rotated the gap to the top, as when they would be hung in the air you would only see the under side. This was well worth thinking about as really its only worth dressing the chandeliers for a view from below, so you don’t waste anything on top and can focus all the good stuff underneath! Emma-Jayne, my handy helper! Photo by Emma. After adding the pipe insulation, Emma- Jayne thought it would be a good idea to paint it brown to match the willow twigs that id got off eBay. Genius. This really really helped and in fact made the pipe insulation look like one large branch! We used standard acrylic paint for this and just mixed up a colour to match the twigs. Once the paint was dry, we started wrapping the Willow branches around the hoop and fastening it off with black cable ties (again a b&q purchase). The black cable ties soon became invisible once we started layering up the willow. A good tip for getting the Willow to bend instead of snap, is to soak it in water first. I tried to do this but didn’t have a container big enough, but on researching I found many people suggest soaking it to enable it to bend, especially if doing a hoop. I think a wheelie bin is probably the best idea, to fill it with water and stick the Willow in to soak. Next time ill try this! Building up the willow around the hoop. Photo by Emma. 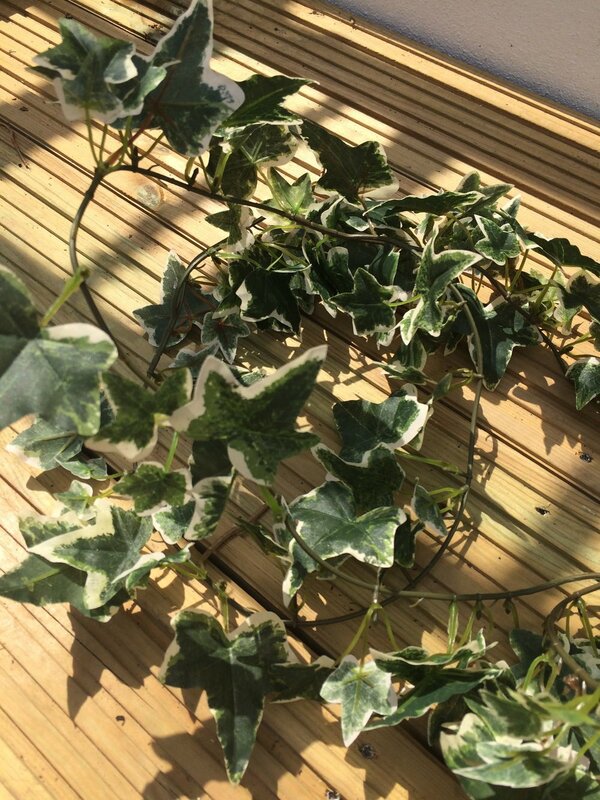 Once we had added the Willow branches to the chandeliers, we started adding fake ivy, which is something you can easily get online. I got mine from eBay and it comes in 2m lengths. Again we fastened this onto the chandeliers with cable ties and concentrated on the underside rather than covering the whole thing. Once we got into the Marquee, we added satin ribbon (to match the wedding theme colours) and I also added some clear baubles. I bought the clear baubles from eBay and these are the type that have a seam down the centre, so they pop in half which enabled me to fill them with baby’s breath. I would have liked to have used fresh flowers here but to save money and allow them to be done in advance, I bought some plastic baby’s breath online. It was slightly to light a green when it arrived but once the chandeliers were in the air, I didn’t think you would be able to tell too much! I also bought some fairy lights and dressed these onto the chandeliers before we hung them. This part was the only tricky bit in that I employed an electrician to come and wire the lights together so that they could all be lit up and run off the marquee generator. It only took a couple of hours and I think the end result was worth it!! They looked so fantastic on the day and when it got to the evening they helped create a lovely atmosphere in the marquee! What do you think?! I think they turned out pretty lovely in the end!! P.S. We are not sponsored by any company or website, I just find that eBay tends to have all sorts of good bits and bobs for making things, hence why I buy so much from there. You can get clear baubles, hula hoops and fake flowers from loads of places online. This summer I was given the important job of creating some dressing pieces for my little sister's wedding day! Michelle & James tied the knot in August at the incredible Walton Castle, which provided a very dramatic backdrop for some big bright L O V E letters. Starting on the computer, I was able to draw the letters at full scale and prepare them ready for the shapes to be CNC cut out of mdf. I visited the wonderful FabLAB Airedale and was shown how to use the CNC machinery, in order to create the shapes. Here are the first 2 letters cut out. The shapes were almost 4' square each so we could only get 2 out of one sheet of mdf. Michelle asked me to match the colours of the paint for the letters to tie in with her theme colours for the wedding. She had a very vibrant colour palette chosen with a fun, carnival vibe, and we thought the letters would compliment this theme nicely! We decided to try a test with letters trimmed with white, but soon decided that black would make the text stand out more against the stone backdrop of the castle. I used a mixture of acrylic with emulsion to get strong colours to grab attention of the wedding guests. On the wedding day, it was lovely to see everyone having photographs taken against the text and interacting with the pieces and made a great backdrop for this shot by Andy Gaines Photography. If you have an idea for some wedding signage that you would like us to create for you, please drop us a line here. A spot of Logo Design..!